Take a memorable, seven-mile, 55-minute round-trip train ride on a former branch line of the Chicago & North Western Railway nestled in a valley between the Baraboo Hills in rural Sauk County. Passengers ride in restored steel coaches built a century ago. 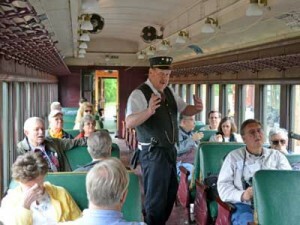 An authentically-attired conductor will call “all aboard!” before the train leaves from a historic wooden depot, built in 1894. Mid-Continent is much more than just a train ride. Our Coach Shed is filled with restored wooden passenger cars, freight cars and displays from the turn of the century. There you will find examples of Mid-Continent’s nationally-renowned wood car restorations such as the Badger #2 “Fish Car”, the exquisite Art Nouveau-motif of the Milwaukee Lake Shore & Western #63, the 1903-built Copper Range coach #60. In our outdoor display yard, you can inspect steam locomotives up-close, including Copper Range locomotive #29, Soo Line #2645 and Kewaunee Green Bay & Western #49. In all, there are nearly 40 train cars and locomotives on prominent display with many more awaiting restoration. A free self-guided tour pamphlet is available from the depot ticket window. Alternatively, the Mid-Continent Compendium is available from the ticket window for $5.00. It contains 104 pages of in-depth information and makes for a terrific souvenir. Trains depart at 11:00 a.m., 1:00 p.m., and 3:00 p.m.
Departure times differ during special event weekends. These include Mother’s Day (May), Autumn Color (October), Pumpkin Special (October), Santa Express (October) and Snow Train (February). Museum grounds are open from 9:30 a.m. until 5:00 p.m. on days of operation. All trains are powered by diesel locomotives. 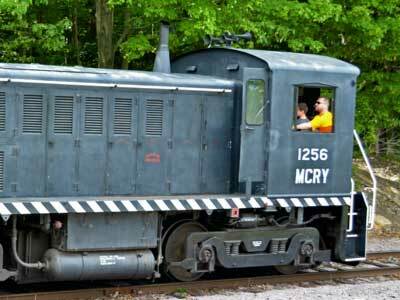 Read more about our ongoing effort to again operate steam locomotives on our Steam Status page. Mid-Continent reserves the right to substitute equipment without notice. Join Mid-Continent for a trip through the fall foliage, the glistening winter landscape, and more! Special events mean more departures, more experiences, and a wider variety of ticket options. Click the events listed below for more information. 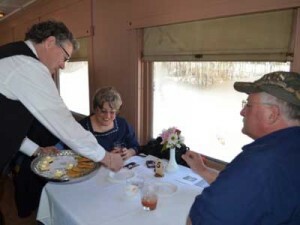 Experience the tradition of dining aboard a train! Onboard dining ticket holders are welcomed aboard one of two First Class railcars, the C&NW #440 business car or the Soo Line #2017 diner-lounge car. We offer a variety of dining menus and experiences. Browse our list of onboard dining events and click on an event for greater detail. Fares differ during winter events and Onboard Dining trains. *Locomotive Cab seating is a high-decibel environment. Hearing protection is highly recommended for children and those with sensitive hearing (not supplied). Access to cab requires climbing vertical steps. Capacity: 1 adult or 1 adult with 1 child. Additional notices and restrictions may apply. *Bus driver and group leader ride free with adult groups. ** Bus driver and group leader ride free with child groups. Other adult supervisors and parents pay child group rate. Special trains can be scheduled for school and adult groups on days of non-operation by calling 800-930-1385. Museum tour guides can be made available if arranged in advance by contacting the museum office. 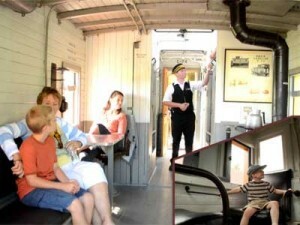 COACH: Coach car seating is the most popular fare type and is the traditional train ride experience. LOCOMOTIVE CAB: Sit across the cab from the engineer and experience railroading from a perspective few people ever get a chance to see. CABOOSE: Lower caboose seating shown. Additional seats located in the cupola section, shown in insert. ONBOARD DINING: Onboard dining is offered during select dates and events. All dining service ticket holders ride in our luxury cars and are waited on by uniformed servers. Mid-Continent is located at North Freedom, Wisconsin, about one hour northwest of Madison, and 30 minutes southwest of Wisconsin Dells. See the Contact Us page for our address, directions, and contact information. There is ample free parking at the museum. Public restrooms, a picnic shelter, and Pine Tree Park are adjacent to the depot. There are no camping facilities at the museum.